Garmin iQue M5 has been discontinued. The Garmin iQue M5 is perfect for today's mobile professional who wants to get from the boardroom to the hotel without asking for directions. 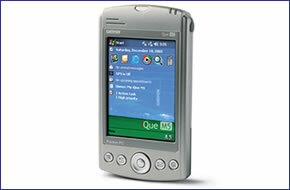 Featuring the latest Microsoft Pocket PC software, Windows Mobile 2003 Second Edition, the iQue M5 supports portrait/landscape screen orientation for easy viewing of documents, videos, and web content. It's powered by a 416-MHz Intel PXA 272 microprocessor, and it also provides the user with 64 MB of RAM, 64 MB of ROM and data back-up protection. The embedded Bluetooth transceiver allows the user to establish a personal-area network with computer systems and Bluetooth-enabled devices such as mobile phones, other PDAs, and printers. Check e-mail and view documents-then sync seamlessly with your laptop. The GPS antenna on the iQue M5 folds flush with the back of the unit. Press the antenna release switch, and it simultaneously powers up the iQue M5, acquires satellites, and defaults to the QueMapT interface. Once the antenna switch is triggered, the M5 prepares to navigate. The antenna can be adjusted for optimal GPS signal reception in any vehicle or rental car. The unit comes with a sturdy windshield mount with integrated charger and speaker. Do you have a question about the Garmin iQue M5 or other handheld GPS related question that's not been answered on this webpage? Please see our handheld and Outdoor GPS FAQs page for questions from other customers.Plus if the answer to your question isn't featured, use the online form to ask us for the answer. Alternatively please telephone 01733 777623 Monday to Friday (9:30am-5:00pm) to speak to one of our sales team.